Woo-hoo! On the road by 8:30! After a good breakfast, we hit the road toward North Dakota… that’s the way to start the next leg of the trip! Grandmother laughs and says that Tim serves as driver, I’m the stewardess giving snacks and drinks and taking trash, and she’s the only true passenger. 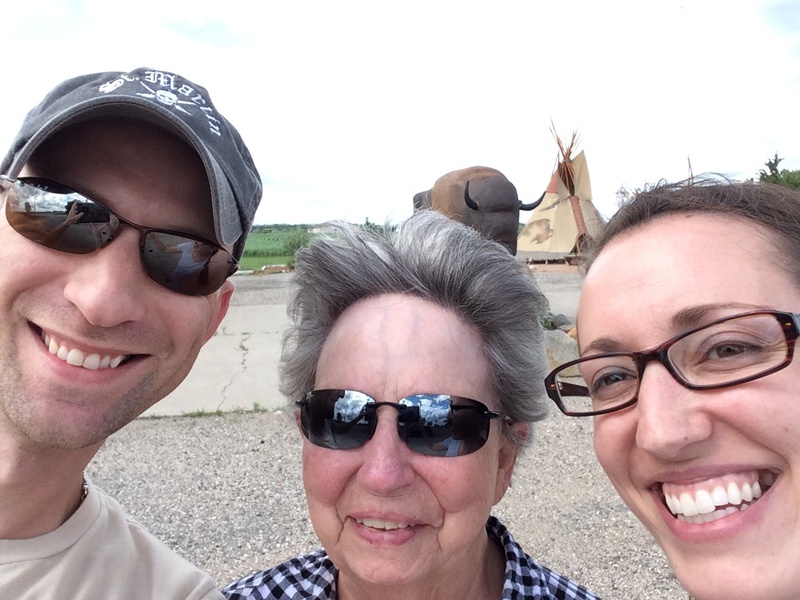 We stopped about an hour outside Fargo for gas and found ourselves at the Continental Divide–there was a little touristy spot across from the gas station that marked the spot, so we got out to take a fun picture. 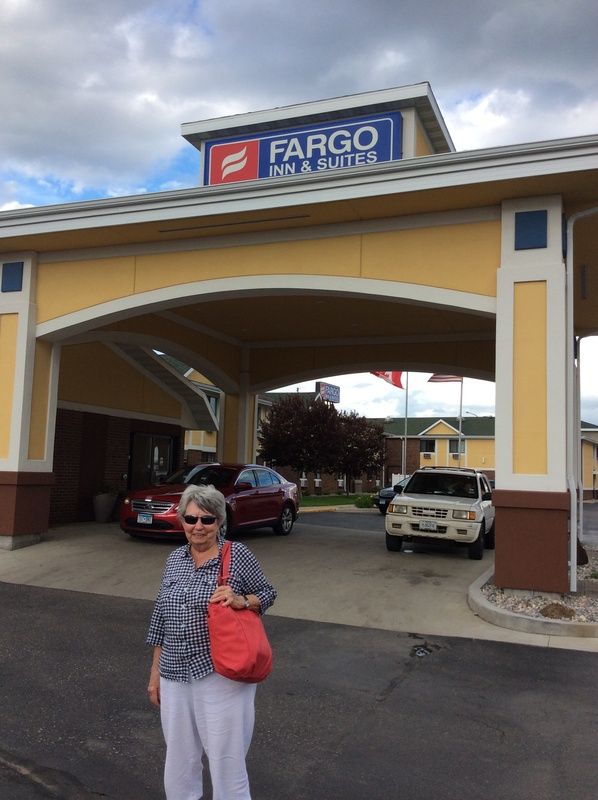 Next up, we had a little break in Fergus Falls before moving on to Fargo. 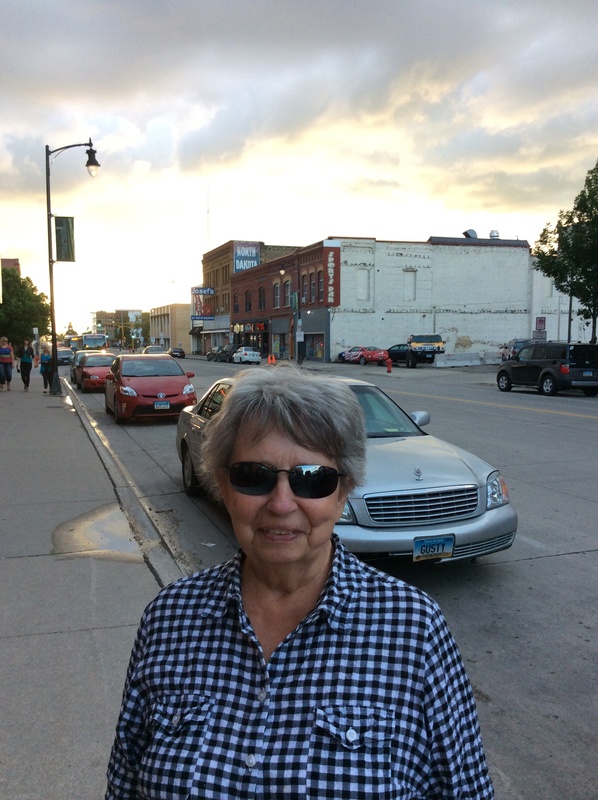 Fergus Falls was a place we met some nice Minnesotans and a few fellow travelers. 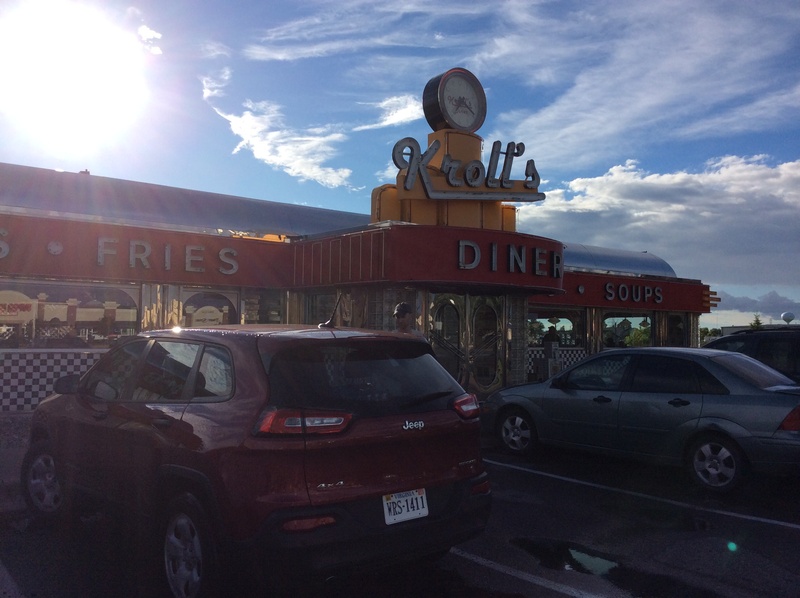 Once we arrived in Fargo, we headed out for dinner at Kroll’s Diner, a German/American restaurant in an old-school diner setting. Grandmother and Tim tried their famous knoephla soup and enjoyed it. 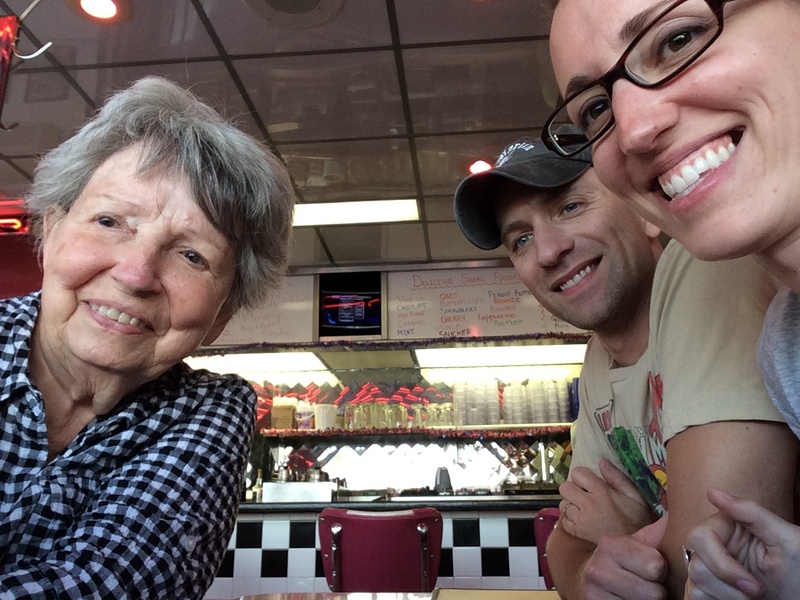 Grandmother had livers for dinner, and Tim and I got burgers (his with sauerkraut of course!). 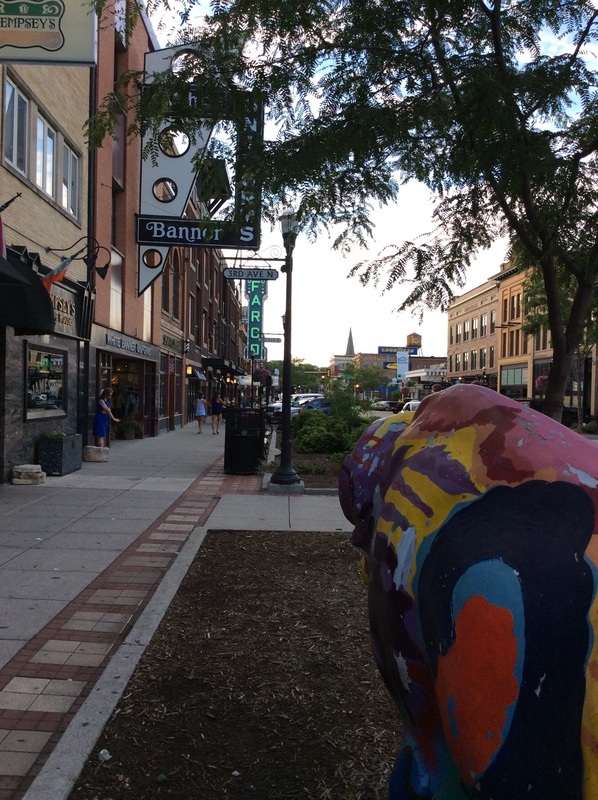 Dinner spot in Fargo… Ruby, our Jeep, and a courteous Tim Parker make a cameo in this shot. 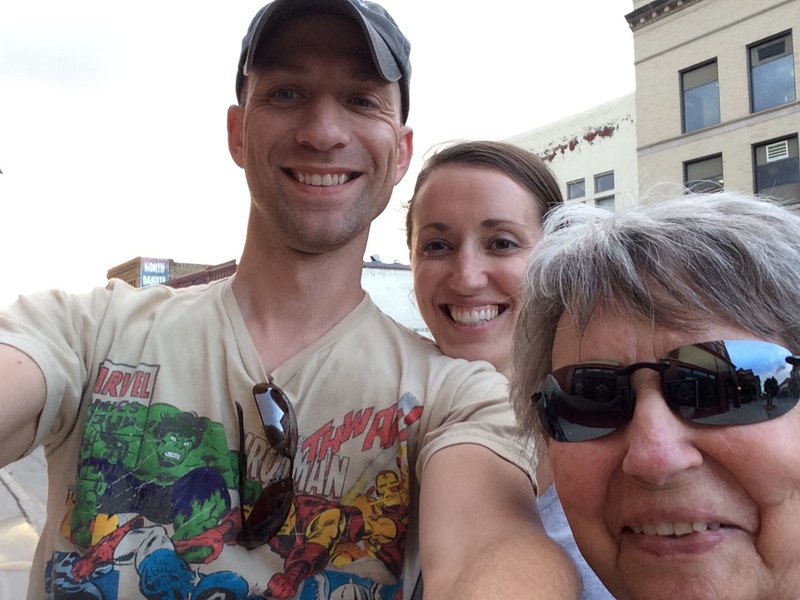 After dinner, we headed to downtown Fargo to see the sites. The downtown was quaint with a busy railroad line running through. Driving back to the hotel, we saw the most amazing rainbow. Tim pulled into a parking lot so Grandmother could get a good look, and I got out and took a picture. The picture from the iPad just doesn’t give justice to the beauty of this rainbow (maybe I should have used the Nikon for that!). We all agreed we had never seen one so vibrant. 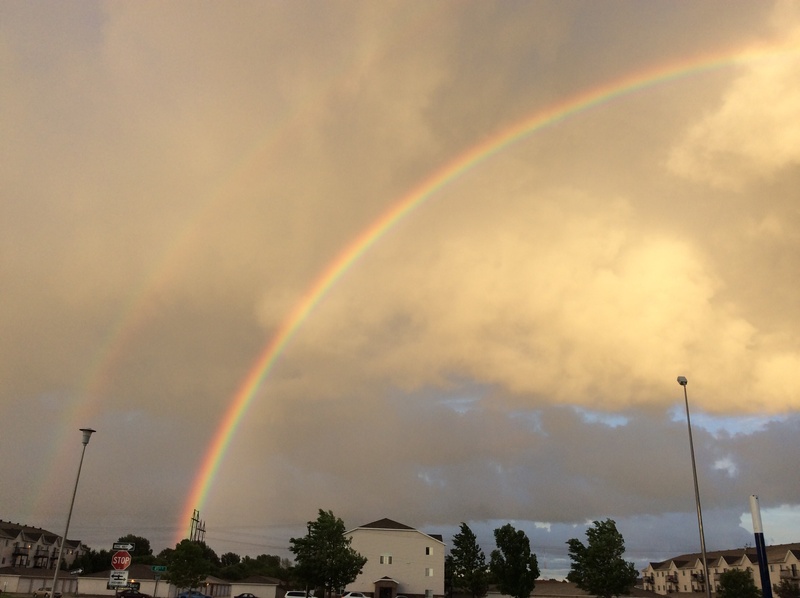 It was a full rainbow, though I only got half of it in the picture (and note that it’s double). “Another part of God’s beautiful creation,” Grandmother says. Oh the hotel… definitely not the classiest place I’ve ever seen. And much to our chagrin, we discovered that our room is separated from a bar and casino (though it has to be the smallest casino I’ve ever seen) by two walls… we’ll see what kind of night we have. If we get desperate enough and we can’t beat ’em, we may have to join ’em… Wish we could have found a friends and family discount around here! She smiles because she hasn’t been inside yet… haha! A story highlight from the hours on the road today: Grandmother told us about her first trip to Virginia when the war ended: Gas was rationed, so the group had to pool gas and truck stamps together to get there. 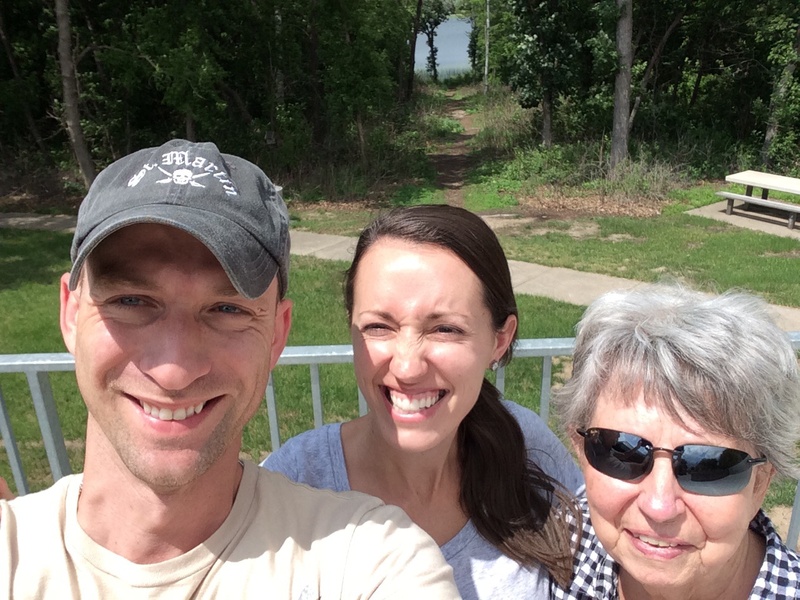 She said one of her favorite memories of that trip is of the paddle boating she got to do around the Virginia swamps. 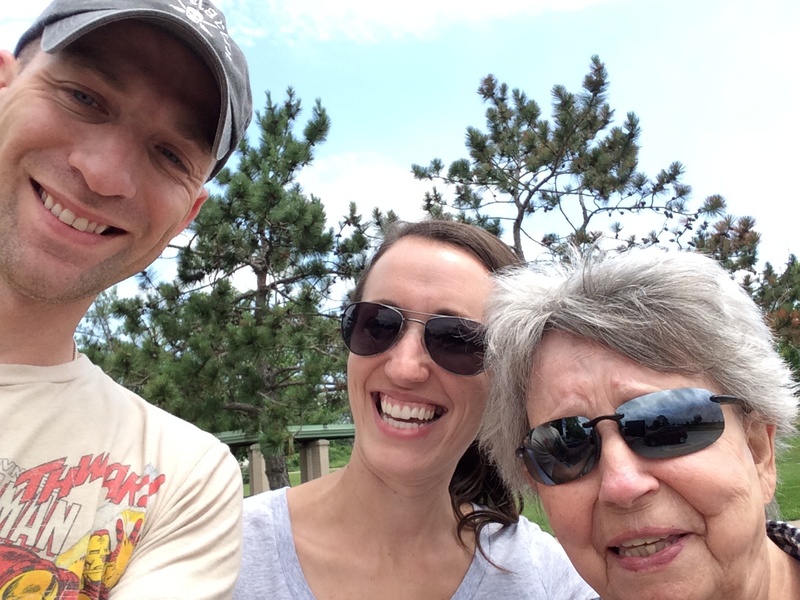 This trip was also the first time she shot a gun–and she almost shot a cow. She said it was also the first time she had a cigarette in her hand: her brother Paul gave her one to puff on to keep the giant mosquitos away. On to Mt. Rushmore tomorrow! Did you see any of the flooding that has been on the news? No flooding at all. Just some torrential rain for very brief periods… maybe lasting five minutes each time. Give Gilesy a pat for us!